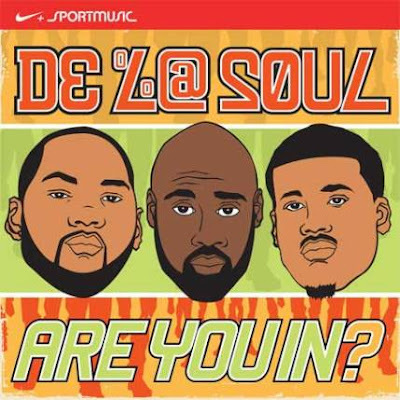 This was supposed to be a random bonus song attached to the AmpLive post but I started writing about it and it ended up being too long for that so here she is: De La Soul made an album with Nike last year(?) as part of the Nike+Original Run campaign where Nike got artists including Crystal Castles, Aesop Rock, LCD Soundsystem and A-Trak to make 45 minute albums that people are supposed to work out to. They follow a certain format where the songs have to start calm and get more upbeat/intense, then the end of the album has calm songs again. This is supposed to match the way that your work out goes, warm up, cool down, etc. The full album titled Are You In (get it? R-U-N) is 44 minutes of continuous play, ie its not divided into individual tracks although there are specific songs within the album, you just can't necessarily select between them. Overall the album is pretty cool, I wasn't listening to it while working out though so it did seem a little bit cheese at some points. Still though, its not like its some 90's aerobic work out CD. This is a De La Soul album and sounds like one, they're not talking about nike or getting jacked the whole time. Thanks to technology the album has been cut up into its songs which led to my discovery of one of the 'cool down' songs called Forever, check it out below.